This is the novella that started it all. 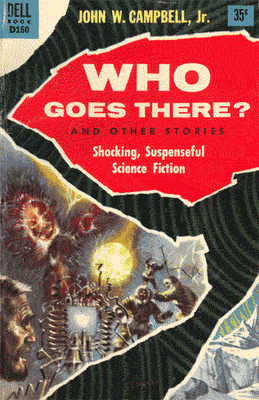 “Who Goes There?” was written by John W. Campbell, Jr. (as Don Stuart) and first published in August of 1938, in Astounding Science Fiction. 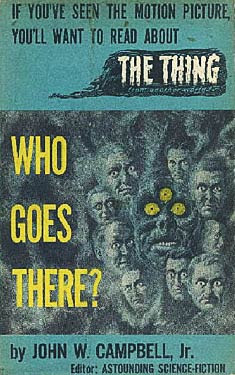 Since its publication nearly eighty years ago, “Who Goes There?” has been adapted as a film at least three times (in 1951, 1982, and 2011), and the narrative has formed the basis of TV programming, comic-books and even video games. Despite its age, the novella remains abundantly tense -- and well-written -- today. I last read “Who Goes There?” in September, 2017, in preparation for this review, after first encountering it -- in serialized format -- in Starlog Magazine in 1982, when I was only twelve years old. 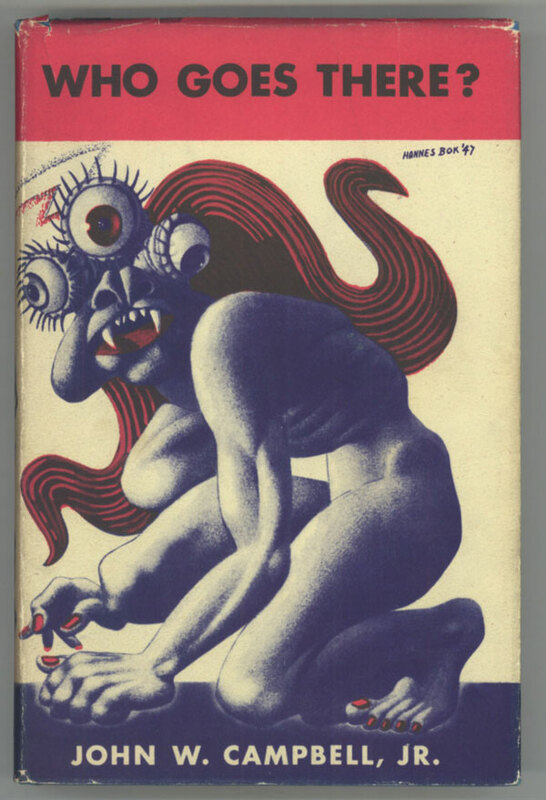 Since then, I have read Campbell’s [1910-1971] story at least three times, and always come away from the tale with a sense of respect for the writing, and a feeling of terror from the narrative’s details. This is a story that, in light of its setting and conflict, makes the blood run cold. The novella “Who Goes There?” involves the discovery of an animal “not terrestrial in origin” in Antarctica. The scientists who uncover it believe it has been frozen in the ice for twenty million years, and never thawed. The creature’s spaceship is described in the novella a “submarine without a conning tower,” some 20 feet long and 45 feet in diameter. The characters who encounter the alien -- a so-called “passenger” on the ship -- are largely familiar if you’ve seen the 1982 John Carpenter film, which is very faithful to Campbell’s story. In the novella, you’ll meet second in command McReady (MacReady in the film), Blair, Doc Copper, Garry, and Norris, for example. The novella’s version of Norris is quite different from the film’s version, but the other characters are remarkably similar. There are some names, too, in the novella, that haven’t made it to screen yet: Kinner (the cook), Van Wall (the chief pilot), Barclay, and Connant, for example. In total, the novella places 32 men at the South Pole outpost, rather than the small handful of men we encounter in the 1982 film. There, we meet a dozen or so men: Garry, Fuchs, Nauls, Childs, MacReady, Norris, Palmer, Windows, Copper, Garry, Blair, Benning and Clark. The novella does an especially powerful job describing the “white death,” or snow of Antarctica, an inhospitable environment for man, or alien. The reader learns, for instance, that the thing frozen within ten feet of leaving its ship. This is not a place from which escape is easy, and that’s a key point. Another image in the story that stands out is the alien being itself, which is said to possess three red eyes, and wear -- even frozen -- an expression of pure malevolence. One character notes that the alien “…grew up on evil…and amused itself through maturity on new and ingenious torture.” There is some talk about the “relative” nature of facial expressions; and that this look may not equal malevolence on another planet. But like Norris and others, the reader doesn’t buy this explanation. We know, just from Campbell’s description of the alien, that it is irredeemably hostile. No filmed version of The Thing has yet managed to depict this “original,” form of the alien, the three-eyed, red-eye beast. The 1951 film went for a dome-headed, white humanoid creature played by James Arness, and Carpenter’s alien, seen in the 2011 prequel too, is constantly in transition; always in the mode of transforming into something else after discovery by humans. Carpenter’s film very closely mirrors the events of the novella. 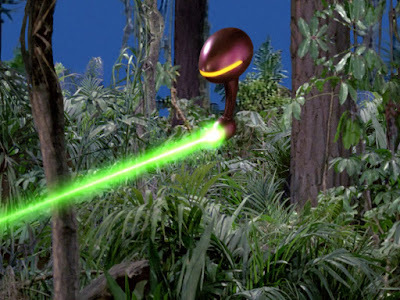 Set pieces such as the infamous “blood test” (to determine who is human, and who is a Thing), and Blair’s near escape from the camp after building a mini-spacecraft, exist in the Campbell story. Indeed, the idea of Blair going from paranoid mad-man -- attempting to destroy the technology in the camp -- to Thing, is also captured in the novella. We learn, at story’s end, that he was nearly finished building his ship, and preparing to escape his pursuers, and the continent of Antarctica all-together. Had he succeeded, the entire human race would have been imperiled. Campbell’s Thing is a shape-shifter who can take the form and memories of human beings (or sled dogs), but the novella also gives the alien a power or ability not seen in the feature films: a form of telepathy. Perhaps this facet was considered too far-fetched for any filmed version of the tale. But, significantly, the addition of telepathy to the alien’s abilities makes it seem a menace that is not just physical. The alien is, for lack of a better word, cunning. It is smart. But perhaps the greatest difference between “Who Goes There?” and Carpenter’s The Thing involves the initial discovery of the alien. Here, it is McReady’s team -- not Norwegian scientists -- who discover the spaceship (constructed of an impenetrable alloy) and end up destroying it. In the novella, McReady’s group then finds the Thing, loads it on a tractor, and returns it to camp. Upon return to camp, there is a major and lengthy scene in which the scientists, Blair, Norris and Copper debate the pros-and-cons of thawing the alien. There is much discussion of what kind of microbial dangers it might possess. There is also talk that human germs might harm the alien, instead. Ultimately the camp commander, Garry, decides that the danger to the camp is minimal, and decides to go ahead with the de-thawing. Big mistake, right? The closest scene in Thing history that we get to this one actually comes from the Hawks film, not the Carpenter one. The men of Outpost 31 in the Carpenter film are confronted with a fait accompli. The Thing is already thawed out (and already ensconced in their camp, in the form of a dog). When they become aware of the Thing, there is no choice to be made…it has already infiltrated their group. Because of this, there is no real opportunity for the characters to debate the morality or danger of thawing the life-form out. In terms of theme, “Who Goes There?” presents an intriguingly balanced view of man. The men of the camp make a mistake by thawing out the monster, and yet, ultimately win their battle against it. Their faith in science leads to the pitfall of “curiosity killed the cat,” but also leads them to understand and out-maneuver, if only by a little (30 minutes?) their mortal enemy. All in all, there is something incredibly pure about this particular horror story. Two races battle it out on the most inhospitable “alien” terrain of the planet, and there can be only one victor. Certainly, the isolated location, and the nature of this particular enemy make the story a classic, but they make “Who Goes There?” more than that too. This is the perfect candidate for translation to the cinema, the perfect template for an icy visualization. It’s easy to see why Hollywood has returned to Campbell’s novella so often. I've tried hard, real hard, to get into the novella, but can't. I just can't crack it. Not sure if it;s impatience or just much preferring the film versions. Even so, I do like the fact that some of it is in the 1950s version. The incredible debate over whether to thaw it our or not in The Thing From Another World is a great high point of intelligent, filmic science fiction. Also note that late in the film, near the climax, one team member wonders if the Arness creature may in fact be able to read minds. All in all, although I;m not fond of the prose version, I'm glad it exists. If not, we wouldn't have has two wonderful films. I really should read this. Like you, I had awareness of "Who Goes There," but had never actually read it until it was presented in Starlog magazine over three issues. For some reason, I had xeroxed all three portions, and still have that xerox copy to this day. It almost feels best read in serialized format, for this is how most science fiction stories were originally presented in print from the 30's to the 50's. I recently re-read the novella, but found it somewhat inert and verbose. I enjoyed most of it, but found some of it challenging to get through. I don't know why that is. I have fond memories of reading it when it was presented in Starlog, and could hardly wait for the next chapter. One thing that stayed with me, however, was the creature itself. It still hasn't been presented as written by any of the films inspired by it. Campbell presents imagery that still startles and reaches deep into the reader's psyche, tapping into the fear that exists in all of us. The discussion you mention in which the men discuss thawing this unknown, screaming, hideous thing, and think they can actually contain it, is practically an extended statement about mankind's hubris, and our belief that we can overcome any threat, no matter how unknown. I believe the modern phrase that most captures the tone of that conversation is, "What could possibly go wrong?"